Author & Storyteller—Telling stories that engage the ear, challenge the mind and delight the soul. He is most certainly cunning and clever, but is Kweku Ananse the most clever of all? He thinks so and in Today‘s Water, he sets out to prove it! Before this tale of Ananse’s quest, we see him in other tales, earning his reputation as a crafty and ingenious trickster. Along the way, we also find out why the sky is far from the ground and how it came about, that all stories, are Ananse stories. 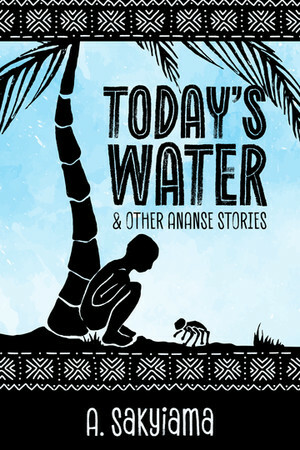 If you have never heard of Ananse, this collection of stories is a great introduction to him. Ananse is a trickster who enjoys getting the better of anyone he crosses paths with. From a lowly lizard to kings and gods, no one is safe from his tricks. He is also a shapeshifter who can turn into a spider and hide when in trouble. Sometimes he’s the hero; most times, he’s the villain and occasionally, he’s just the narrator. While Ananse stories are told all around the world, this set comes from the source—from the folktales of the Akan people of Ghana, West Africa. How it came about that the sky is far away from the ground. All stories belonged to God, until Ananse paid a very high price for them. How did he do it? Ananse has a brother? Oh brother! Why would the famously lazy Ananse organize a work day? Lizard asks Ananse for food and gets. . .what? a haircut? What can you get for a grain of corn if you are as crafty as Ananse? What happens when Ananse sets out to prove that he is the most clever person in the world? Each story is also available as an audio-ebook, narrated by the author. Try one, or get the whole set at 50% off. The paperback and audiobook versions of the collection are in the works. If you want to know as soon as those are ready, sign up for my Book News Mailing List. You’ll be first in line to hear about new releases, special deals and other exclusive content. All Rights Reserved © 2013 - 2019 A. Sakyiama.